Lemon grass, scientifically known as Cymbopogon citratus is an herb native to the Southern part of India and Sri Lanka. The coarse, tufted leaves impart a citrus-scented flavor to the recipes and this makes lemon grass a very popular ingredient in Thai, Vietnamese, Malaysian, and Indonesian cuisine. 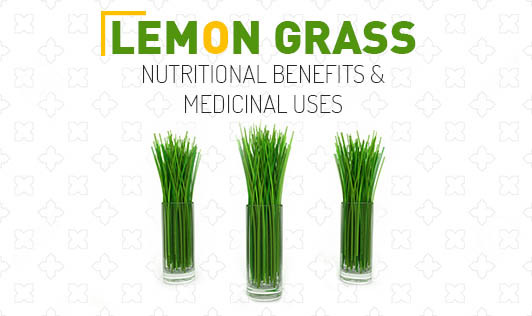 • Lemon grass contains 99 calories/100 grams and contains no cholesterol. • The leaves and stems of lemon grass are a very good source of folic acid. On an average, 100g of lemon grass gives you 75µg of folic acid. • It contains many essential vitamins like pantothenic acid, pyridoxine, and thiamin. • Lemon grass, whether fresh or dried is rich in various minerals like potassium, zinc, iron, copper, calcium, and magnesium. • "Citral" a compound found in lemon grass has been widely used in the synthesis of vitamin A supplements by pharmacologists. • It is used as a flavoring herb in herbal teas. • Lemon grass is helpful in relieving gastric problems like colitis, indigestion, and gastroenteritis. • It is used in aromatherapy to revitalize the body. • It is useful in relieving stress-related issues like headaches, body aches, and nervous exhaustion. • Lemon grass is useful in relieving infections like sore throat, laryngitis, and bronchitis. • Lemon grass oil is an effective skin-toner and is widely used in massage therapy. This amazing herb is easily available in the Indian market. Although you can use it many dishes, the best way to have it, is to make tea out of it for easy consumption and maximum benefit.